The worst option is to interfere and block the natural processes of the body – in this experiment poking and prodding the chicks out of immobility. The chicks were immobilized by holding, the inescapable threat inducing the freeze response. My experience of TRE (Tension and Trauma Releasing Exercises) has shown me that shaking is a natural part of recovery from trauma. Even though it can appear that people are falling apart when shaking, it is better to fall apart briefly, rather than hold on to a life time of chronic tension. 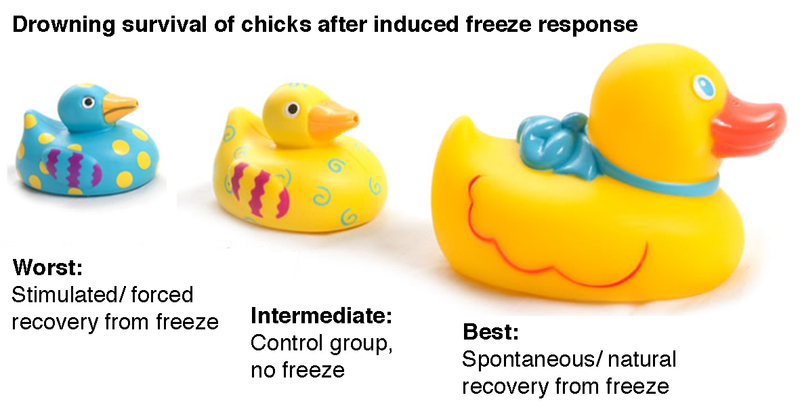 With thanks to Riccardo Cassiani Ingoni for the reference and image – I saw Riccardo talk about the chick experiment at a TRE Level 1 course in London.